The oldest functioning church in Paynesville -- dating back to 1889 when the church was built, a year after the first Episcopalian services were held in New Paynesville -- is being renovated this summer. The oldest church building in Paynesville is getting a facelift. This summer, St. Stephen's Episcopal Church, located on the corner of Hudson and Wendell streets, is being renovated with foundation repair, new siding, and a new handicap access. While it is not the oldest congregation in Paynesville, its building dates back the longest. The first Episcopalian worship service was held in New Paynesville (then with 600 inhabitants), attracting 100 people in June 1888. The first brick was laid for the church building in January 1889, and the frame church opened in May 1889. St. Stephen's Episcopal Church - shown stripped of its stucco to reveal its underlying frame structure - is being renovated this summer. The church was built in 1889 and is located on the corner of Hudson and Wendell. Older congregations still exist in the Paynesville area, but none of the older church buildings (such as the original Methodist church - the former museum - located on Highway 23) are still used as churches. "Realizing that this church has been here since 1889, if we're not good stewards it won't be here in 100 years, or even 50 years from now, for future generations," said Harriette Burkhalter, an evangelist lay minister in the Heartland Total Ministry Team, which serves St. Stephen's and two other Episcopal churches. "My feeling is this is just as important to the history of Paynesville as the main street," said Rev. Doris Dodds, a member of St. Stephen's for 15 years and a member of the total ministry team for four years. The "crying need" for the church renovation was the stabilization of the foundation, agreed Burkhalter and Dodds. The church fixed the foundation, or lack thereof, last fall. "There isn't a foundation; it's sitting on the ground," said Jack Burkhalter, who has owned a farm outside Eden Valley with his wife since 1973 and were weekend visitors before becoming regular summer members the past ten years. Last fall, sagging points in the foundation were dug out, and new block was added to support the church building. This summer, the cracked stucco was totally removed. (Spots had been uncovered last fall when the foundation was fixed.) 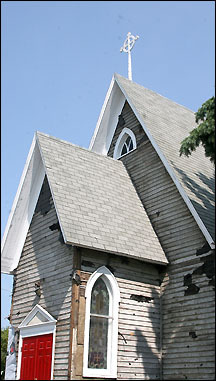 Off-white vinyl siding will replace the stucco, which should return the church to the frame-structure look it originally had. Hopefully, the entire project should be finished by August. Just last week, the church received a variance from the city (since the structure sits too close to both streets) to install a new door, making it handicap accessible, on the west side (facing Hudson Street). This improvement will make the worship space at St. Stephen's useable to all, according to Dodds and the Burkhalters. The total cost for the project (including storm windows, currently on hold) was $60,000. The small congregation has received support from current and past members and community members. Donations to the St. Stephen's Preservation Fund can be mailed to Mary Ann Erdmann, Treasurer; 15813 Crystal Road; Paynesville, MN 56362. There will be a need for ongoing maintenance as well as future improvements of the church. Within five to ten years, the building also will need a new roof, according to Harriette. "People have taken care of it in the past," added Jack. "It's our job to take care of it now. Someone else can take care of it in the future." The current project does not include any improvements to the Guild Hall, the lower level of the church, including the kitchen and the only bathroom. The parish considered an elevator to the Guild Hall but opted not to do it at this point. Many churches operate without handicap access to the basement, said Dodds. During its deliberations before starting the remodeling project, the congregation talked about moving and building a new church but decided to stay, in part because of their sense of history. "We basically said, "Here's where we want to stay.' We want to continue to serve the community now and in the future," explained Harriette. When constructed in 1889, St. Stephen's cost $2,619.75 (including $1,376 for lumber and $500 for the carpenter). Other significant dates in the church history include: 1910, building reconstruction; 1924, original tower removed; 1933, Guild Hall added; 1942-45, church closed during World War II; 1966, church and Guild Hall connected; and 1998, Heartland Total Ministry Team begins. With Sunday Worship at 9 a.m. weekly, "let the entire city of Paynesville know that this church is open," said Dodds. "It looked like it was ready for demolition, but it's not. It's open. It always has been." The church has been in continuous operation since 1889 - except for 1942-45, due to the lack of a minister -said Dodds. The Heartland Total Ministry Teams - including churches in Paynesville, Little Falls, and Sauk Centre - relies on trained reverends and lay ministers to fulfill all the functions of a paid priest. During the construction this summer, St. Stephen's has had understanding neighbors, said Dodds and the Burkhalters. In addition to construction this summer, neighbors have been understanding when members park on the street for Sunday services. When the church was built it was on the outskirts of New Paynesville in 1889, reminded Dodds, and the founders never envisioned the need of a parking lot.